It is with no doubt the complex and rich aroma in whisky that makes the spirit so charming. One of the secrets of tasting the complex flavors is in the glass you use and while the composition of the spirit doesn’t change, the size and shape of the glass DOES influence how we perceive the aroma and texture. Through specially developed protrusion forms inside the glass — adapted through studying bio-mimicry — when swirled around the glass the fluid forms a standing wave shape, which increases the surface to air ratio and rate of oxidization. The effect here is that considerably more ethanol evaporates. This resulting reduction in volatility allows the whisky to become significantly more expressive. 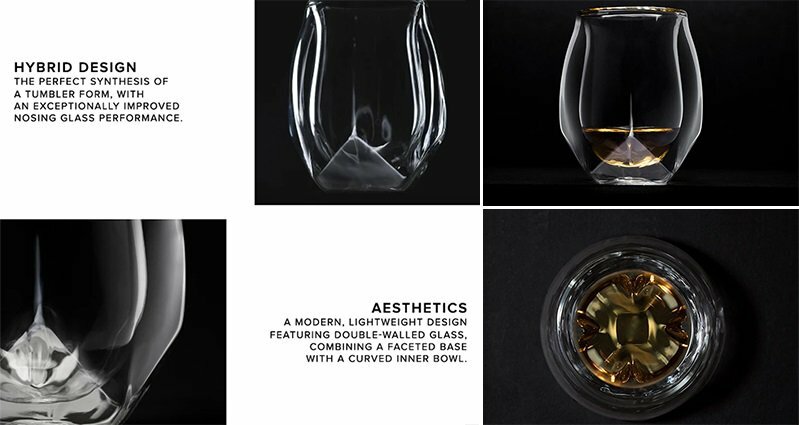 This feature is an invention of the Norlan glass — no other whisky glass will do this for you. Why I like the Norlan glass: I feel like Norlan is just the right compromise between a more traditional nosing glass and a tumbler. I also particularly appreciate the quality of the glass and its design. Also, it can happen that while sampling some single cask whiskies of higher proof, it’s just too much for me to handle and in this case, I found Norlan to be quite a good alternative to water. The glass will bring out the aromas without burning too much. More than a single glass, Tripod have come up with a set of 3 glasses to suit every occasion. To bring you the most fulfilling whisky tasting, Tripod Glass set prepared 3 glasses, each with different design features, that unveils different aroma notes, and complements each other to compose a complete whisky experience, for you to enjoy every aspect of your favorite drink. Copita Glass: Aroma notes will distribute evenly around the rim, presenting the most authentic taste of your spirit. Tumbler: The wide opening allows ethanol to dissipate quickly, as drinkers can enjoy the wild and straight flavor. Caldron Glass: The distinctive shape concentrates rich aroma in its round belly, and let the fruity and floral bouquets flows naturally along the flared rim. Why I like Tripod Glasses: this little leggy-pokemon glass is just so cute… But seriously, I love the idea behind this set of glasses: designing 3 different glasses to suit our mood is exactly what whisky is about to me. I’ve always heard people say “there’s a whisky for every occasion” – so why shouldn’t it be the same thing with glasses? I would for instance go for the tumbler glass if I’m enjoying my whisky on the rocks or in a cocktail or choose the copita for a proper traditional tasting (especially if I need to come up with tasting notes). Also worth noting, those 3 glasses have been thought, designed and produced in Taiwan to reflect antique drinkware and Eastern traditions, which I find utterly cool!